Yamazaki, Masakatsu. 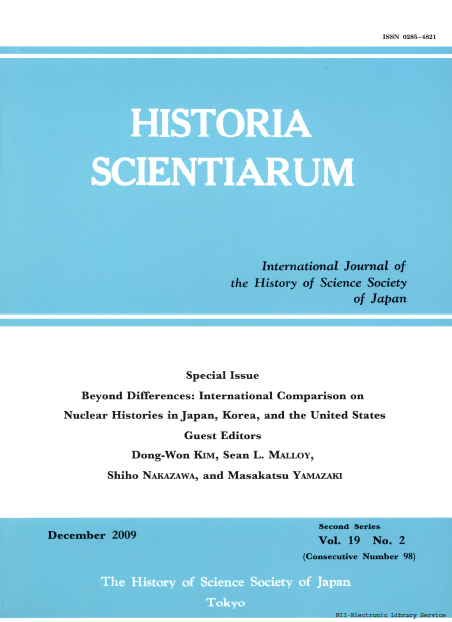 “Nuclear Energy in Postwar Japan and Anti-Nuclear Movements in the 1950s.” Historia Scientiarum 19, no. 2 (2009): 132-145. Masakatsu Yamazaki’s “Nuclear Energy in Postwar Japan,” the product of an international workshop held at the Tokyo Institute of Technology in March 2009, wonderfully captures Japan’s strange and ambivalent flirtation with the nuclear impulse after 1945. In Yamazaki’s account, Japan’s subsequent nuclear history appears far more contested, and deeply conflicted, than is typically represented, and emerges against the backdrop of a strong and active domestic anti-nuclear movement. The crux of his argument involves the infamous 1954 Lucky Dragon (Daigo Fukuryū Maru) incident in which a Japanese fishing vessel was exposed to radiation due to its proximity to the Bikini Test site, a failure of the Americans to anticipate the extent of the blast radius and subsequent fallout patterns. For Yamazaki, this moment represents the key point at which the Japanese public, via the news media and the corresponding activities of scientific elites, began to grasp fully the reality of a nuclear blast, in contrast to the more mild response following 1945, which had been shaped by Occupation censorship. Despite official attempts to control the story, information concerning radiation burns and the possible contamination of seafood got out quickly, raising the level of concern across multiple sectors of Japanese society. For example, Yamazaki chronicles the research activities of Japanese scientists who collected and analyzed data gathered in the aftermath of the test, seeking to understand the explosion’s effects. At the same time, he also provides stories from Japanese housewives, who provided a critical voice in the early, formative anti-nuclear movement. What makes this discussion particularly fascinating for students of history is the awareness that Japan would begin its nuclear program shortly thereafter. Yamazaki argues that this development was far from inevitable; in fact, it was contested at many levels, as a significant segment of the Japanese citizenry registered their opposition to it. The article ends with a discussion of the principles underlying Japan’s long-held non-nuclear stance. Yamazaki again challenges the official story, indicating that the existing system does not work, and even hints at the state’s possible complicity in allowing safe passage to American nuclear arms while in port. In the post-Fukushima era, Yamazaki’s skepticism—and indeed the entire special issue of which it is one part—makes for a welcome contribution to the much longer story of Japanese energy and, in particular, civilian nuclear power.